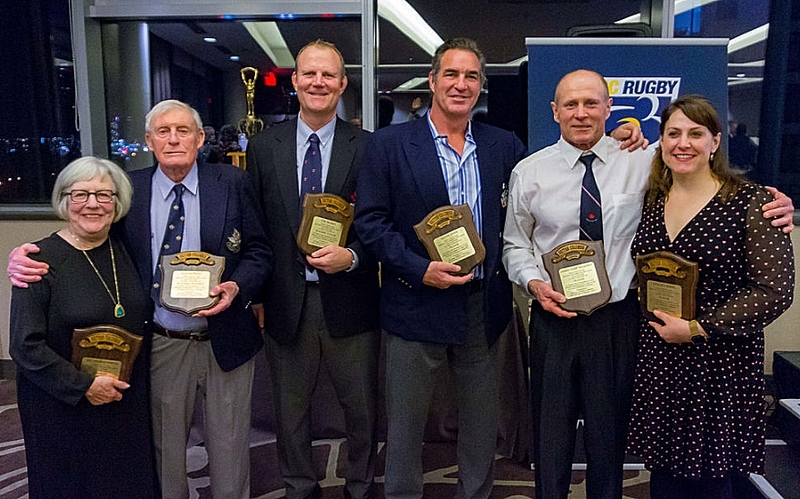 Vancouver, January 15, 2019: The Class of 2019 were inducted into the BC Rugby Hall of Fame this weekend amid a celebration of some of our sport’s great contributors. A total of six inductions were made: Alan Banwell (Builder/Referee), Glenn Ennis (Player), Leslie Cripps (Player), Gordon MacKinnon (Player) Tim Murdy (Builder/Coach) and Jim & Joan Porter (Builders). These esteemed individuals were joined by family and friends from the rugby world for a gala dinner at Element Vancouver Metrotown to recognise their collective achievements. The function suite was full of warm conversation and laughter as the guests arrived on Saturday evening, friends reconnecting and reminiscing. Global BC’s Chris Gailus returned once again to host the evening, his infectious good humour and effortless delivery kept the room well entertained throughout the evening. Dallas Gus, a Squamish Nation member, delivered a compelling Indigenous welcome to start the proceedings, reinforcing the messages of recognition and honour. Following a delicious buffet and many conversations amongst the guests, the evening moved on to the awards section. Prior to the Hall of Fame inductions, JoAnn Cleaver was presented with the Joan Spray Award. This award is presented annually to a female member of the local BC Rugby community who through volunteering, has exhibited dedication and a lifelong contribution to the sport. JoAnn’s years of involvement with the grassroots of the game at Magee Secondary were highlighted by BC Rugby Board Member Connie McGinley who made the presentation. Following this, Andrew Spray was awarded the Jack Patterson Memorial Award by BC Hall of Fame inductee Doug Sturrock. This award, first created in 1964 in honour of the outstanding lifetime contribution to sports made by Jack Patterson, is intended to pay tribute to an administrative member of the B.C. Rugby fraternity for their contribution to rugby in British Columbia. Next, the evening progressed to the induction ceremony for the Class of 2019. One by one, the careers of each inductee were eloquently shared with the room by Gailus, illustrated by a slideshow of pictures and press clippings. Following this, each inductee was presented with a commemorative plaque by a significant individual from their past. David Smortchevsky, President of the BC Rugby Referee Society, was on hand to present Alan Banwell with his plaque, while Steph White, former captain of the Canadian Women’s XV, followed suit for Leslie Cripps. Chris Gailus, a friend of both Glenn Ennis and Gordon MacKinnon, was on hand to present each with their plaques, along with some cheeky anecdotes. David Robertson, former Headmaster at Shawnigan Lake School, made the presentation to former colleague Tim Murdy and the evening concluded with Connie McGinley making the final presentation of the night to Joan Porter, accepting on behalf of herself and her late husband. An indisputable highlight of the evening were the acceptance speeches from the inductees themselves. Each member of the “Class of 2019” was full of praise for the colleagues, coaches, teammates and volunteers who had played a part in their eventual successes. These speeches were humorous, poignant, insightful, full of colour and collectively showed the power that rugby has to shape lives and forge life-long bonds. BC Rugby would like to take the opportunity to thank everyone who helped to make the evening such a success. Particular thanks must be made to Langara Fishing Adventures, Seattle Saracens RFC and HSBC Canada Sevens for their generous prize donations for the live auction and raffle.